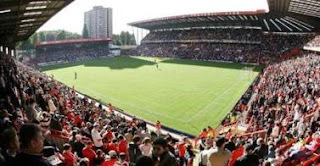 Charlton Athletic Online: Ten Games of Destiny? Yes, just ten games to go in this long old season; it seems like an age that Peter Taylor was in the dug-out in front of me, with blue skies above, and a lovely grassy surface at The Valley. My how things have changed - with the long cold winter came a change in Charlton’s fortunes, but despite all that has gone on, we are at least still hanging on to third position in the league table, and it would not be beyond the club to battle it out for second if the results over these last couple of months do yield anything like 25 points. Of course, last week’s result will have to be well and truly banished from the player’s minds; it is easier for them, as they can get back into training and move on, but for fans it is harder. Even last night, as people started to arrive for my weekly evening course class, the first topic to mention was the scoreline at The New Den last Saturday, whether you were an Addick or not. Still, it’s in the history books now and there is nothing you or I can do about it except pray that we do better next time we play them. So how can Charlton bounce back? How can the memory of a 4-0 thrashing be expunged from their minds? Who will Phil Parkinson drop (and therefore blame) for not being goods enough/not trying hard enough/not caring about Charlton enough (delete as applicable)? There will be changes, Parky has said so, and with another on-loan left back being brought into the club, we can at least expect Gary Borrowdale to start in place of Chris Solly. I don’t know much at all about Borrowdale, though I have probably seen him play once or twice. What he can be is available for the next six games, which may be what we need to get Kelly Youga fit again. Youga did play an hour in a friendly match midweek, so you could surmise that he might be ready for the first team in a couple of weeks (around Easter), but before then, we have quite a few games and Parky obviously doesn’t think Solly is up to the left back job on a consistent basis. Other than Borrowdale, there are no new faces, no returnees from injury, and no star youngsters banging on the door for a game – so what has Parky got in mind? 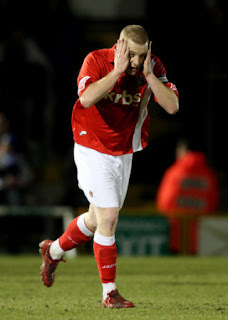 Well, at centre half, Miguel Llera had a very public spat with captain Nicky Bailey after gifting the ball to the opposition for what resulted in their third goal last weekend, so he may well pay the price for that misjudgement by being left out in favour of Sam Sodje. Sodje has had a rough and tumble last few months, starting with his Boxing Day sending off, getting back in the side, having his first child born, and then being left out in favour of Llera. He will probably be champing at the bit – which can be a worry with Sodje sometimes – but I do expect hm to start alongside Christian Dailly. The midfield has had a worrying look over recent months, with Parky unable to work out his best combination. Desperate for a decent left sided midfielder, Kyel Reid has come into the club and done a good job, but in a weird sort of way, this has unbalanced an unbalanced side. With Reid wide left, you would hope and expect that playing Lloyd Sam on the opposite flank would simply be too much to cope with for most third tier teams, but no, it hasn’t really worked for the wide pair yet. In my opinion, this is because Parky hasn’t got the middle pairing right when playing these two wingers. He has tried Therry Racon with Bailey, and Racon with Jose Semedo, but while it may lack much creativity, he has yet to try Semedo and Bailey together with the two wingers. To my mind, if you have Sam and Reid in harness, then the creativity only need come from them, and not via the middle of the park. Playing this combination would allow two forwards to continue, but I have a hunch that we might see Parky go a little more unexpected, and recall Jonjo Shelvey. Shelvey has had a funny season, with some good early performances and goals, but none of the boyhood swagger and endeavour that we saw from him as a sixteen year old. It is tougher in this league, and the now eighteen year old has had to pit his skill and wits against much bigger men, often getting abuse (physical and verbal) along the way. If the Addicks need one player to take the season by the scruff of the neck and haul us back into the Championship, then that player will probably be Shelvey. Playing Shelvey means that either Akpo Sodje or Deon Burton would lead the line, and as Burton did it quite well in the early months of the season, I think he might get recalled. Akpo is a good substitute, but it seems that Dave Mooney has disunited too many fans with his honest endeavour but lack of strength and goals. With Leon McKenzie out injured for three weeks, we need a couple of options on the bench anyway, so Akpo and Mooney will get game time if the result is in the balance. Subs from – Randolph, Solly, Llera, Spring, Racon, Wagstaff, Akpo Sodje, Mooney. The team that Charlton have to restore pride against are Kent rivals Gillingham. The Gills are having a tough season, and have yet to win an away game in this campaign, leaving them close to the relegation places. They would like nothing better than to earn that first away victory against their near neighbours, and on paper, they have a chance to do so. Although Chris Dickson has continued his Addicks form and now usually sits warming the subs bench, he cannot play in this game under the terms of his loan; that won’t worry Mark Stimson though, as he said last week that he prefers Dennis Oli to Dickson anyway! Oli may not start, but he could come on to bolster Simeon Jackson up front if Gills are still in with a shout toward the end of the game. The Gills have only won two out of their last thirteen games, but those wins have been fairly recently against Huddersfield (March) and Bristol Rovers (February). Other than a single goal by Dickson, you have to go back to mid-January to find any player other than Jackson scoring for Gillingham, so it is pretty obvious where the danger lies. Pedro45 can see plenty of straws dangling in the wind at the moment, and in a desperate attempt to clutch at some, I am going to forecast a 2-0 home win. It may not be pretty, it may not be nice, but any win would be good, and it would at least gather a small amount of confidence back into the team as we turn into the final long, home, straight. A defeat, and the dogs would be at our door; a draw, and the questions remain unanswered; but a win, any win, has to happen. My one-to-watch in this game is captain Nicky Bailey. One of the few who can be sure of his starting place (bar some sort of injury or spat with Parky), Bailey has been on his longest barren spell in front of goal this season – it is six games now since his last gasp equaliser at Swindon – so it’s about time he hit the back of the net. Maybe if Deon is back in the starting team it will inspire Bailey to try to beat him in the top goal scorer stakes? You know that you will always get effort from Bailey, whether he is shoved out left, or playing centrally, but what we need in addition is leadership, desire, skill, will-to-win, and goals. If Bailey wants to be anything other than a decent lower league player, then he needs to start showing us how good he is week-in and week-out. Ten games…eight wins and a draw would do it you know….